The Skinny: Well-meaning existentialism permeates this US indie flick starring the charismatic Takeshi Kaneshiro. However, "well-meaning" and "good" are two separate things entirely. This independent film from Korean director Wonsuk Chin makes the PanAsian cut thanks to the appearance of Takeshi Kaneshiro in his first English language flick. Kaneshiro is Kenji, a Japanese slacker in New York City who gets chosen by Death (Mira Sorvino) to die. She warns him that he has only twelve hours in which to livewhat he does with it is up to him. So what does he do? He spends his last hours meeting strange characters before being crushed beneath the the hypocrisy, dishonesty and cruelty that permeates our lives. And no, he doesn't cheat Death. To those familiar with the existential musings of Wong Kar-Wai, Wonsuk Chin's comedy/drama mines some familiar territory. Kenji is a disaffected urban city dweller whose aimlessness is tested when he's forced to look upon his own death. 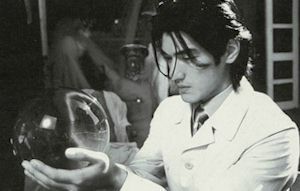 Such themes are winning in their cloying existentialism, and Takeshi Kaneshiro manages charm and hidden emotion despite his somewhat unsympathetic character. Ultimately, this is a well-meaning film that has genuine sparks, but it suffers due to "film school disease." What that means is a too-quirky script and jarring existentialism which makes the film's quest for thematic depth all too obvious. To Tired to Die feels like a film geek project, and possesses enough showy dialogue, cheesy acting and bad director cameos to annoy even the most Quentin Tarantino-friendly.